Sometimes it takes awhile to get around to seeing things. I envy those who have the time to see new releases at the rate I did as a younger man. As I’ve continued on my duties as cohost for RetroPerspective, where we review the movie releases from 1994 week-by-week, I realize I used to go to the movies all the time. It’s one reason I’m very grateful for streaming. While I miss the “event” of going out on an evening at whim to catch a showing on the silver screen, like most people I just don’t have the same amount of time to drive to the theater and blow a whole evening as I did when I was younger. Also, honestly, it’s so much more expensive now as to be a major factor in my viewing habits. And based on the experiences you may have when you plunk down that chunk of hard-earned paper, it’s often not worth it. Even the audience during the remake of Pet Sematary let me down. 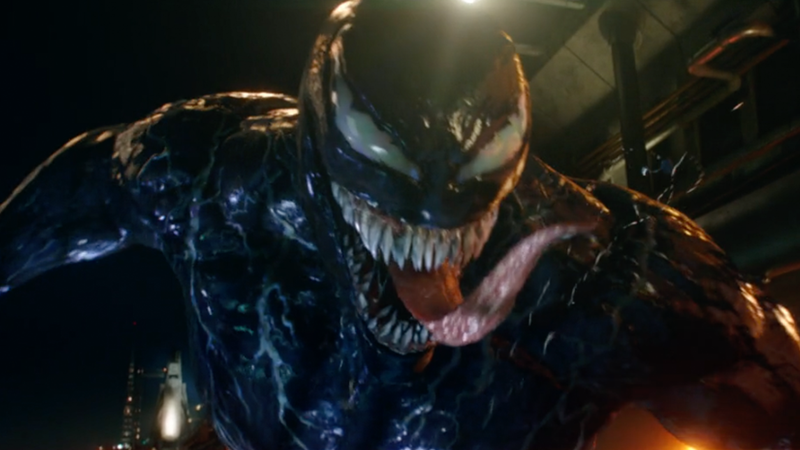 Anyhow, all that to say that I finally got around to watching Venom, the surprise super-story hit from Sony in 2018. I’d heard positive, I’d heard negative, and I wanted to see it for myself to decide. The trailer had looked very promising and I’m always hopeful to find magic where others might find muck. So here’s my review, as posted recently on Letterboxd. On the plus side, Venom looks like Venom. Venom is pretty entertaining, up to a point. There are some clever moments. There is an interesting angle on the fear of what we might discover while exploring space. The inherent mistrust of the power of an Elon Musk is a thread. Agent Smith’s attitude from The Matrix – humans are a cursed parasite on the planet – shows up as well. These are all threads worth following as a whole, but this movie isn’t up to the task. It compulsively follows the template that directs it to culminate in an obligatory large-scale fight with high stakes and maximum spectacle. For that template to work, though, you need a clear throughline and disciplined storytelling. Venom falls short here. It’s trying to do too much at one time. Sure, there’s spectacle but, despite the talent at hand, there’s little emotional resonance. Adding to the problems, Venom is a character that works all right but is robbed of puspose by moving the focus away from his journey with Eddie. The development of their relationship is surprisingly interesting until the movie feels the need to de-emphasize that in favor of yet another CG slugfest. This is a common enough problem in this genre that I don’t hammer it too hard for that. It’s not so much disappointing as expected. Even Batman v Superman: Dawn of Justice fell prey to this baser impulse. Overall, it wasn’t a terrible way to waste a couple hours. Truth be told, though, there are also far better. And now back to my required viewing for RetroPerspective on The Nerd Party! As posted on Letterboxd, I gave Venom 2 stars out of 5, because the initial promise of the movie was pretty strong. It didn’t follow through, and so there’s a sense of disappointment, but it wasn’t the type of movie where I was upset with seeing it by the end. Just disappointed.